Apple didn’t just introduce new laptops Tuesday; it also introduced a new term to the vocabulary of Mac users—DisplayPort. The Mini DisplayPort found on new MacBooks, the refreshed Macbook Air and 15-inch MacBook Pros replaces the DVI and mini-DVI interfaces found on older models. But is this another proprietary debacle like Apple’s failed Apple Display Connector (ADC) interface? No. DisplayPort is, in fact, an open industry standard promoted by the Video Electronics Standards Association (VESA), the same group that determines standard sizes for flat panel display mounts, for example. And Apple isn’t the only company supporting DisplayPort. HP, Philips, Samsung, Lenovo, AMD, Nvidia, Intel and many other companies have thrown their weight behind the standard, so we’ll be seeing a lot more DisplayPort-compatible devices in the coming years. Digital Visual Interface (DVI) has become the de facto standard for flat panel displays over the past few years, and it’s not hard to understand why. It’s a direct digital interface between a computer and a display, which makes it nice and fast, keeps images sharp and colors crisp. But DVI interfaces are big and clunky—probably its most obvious difference with DisplayPort. Compared to a full-sized DVI interface, DisplayPort—and especially Mini DisplayPort—is much smaller. Apple says the Mini DisplayPort—a smaller version of the official spec—on its redesigned portables is 10 percent the size of a full DVI connector. Thus, DisplayPort frees up a lot more space on the side of a laptop as well inside the machine. There are practical issues as well. With DVI, you have to use thumbscrews to insert and secure a connection; you just push a DisplayPort connector into place as you would with a USB device. And you can’t easily bend a DisplayPort connector’s pins, like you can with a DVI connector. But just like DVI and, to a certain extent, High Definition Multimedia Interface (HDMI) video port found on newer home entertainment products and flat-screen TVs, DisplayPort can work equally well connecting a Mac or PC to a flat screen or to a home entertainment system. A lot of what makes DisplayPort better than DVI, though, is found in the technological nitty-gritty. DisplayPort has greater bandwidth than DVI does, for example (no need for a Dual-Link DVI connector, as a single DisplayPort can accommodate a 30-inch screen), and it embeds the clock signal in the data signal, while DVI and HDMI do that separately. It also supports High-bandwidth Digital Content Protection (HDCP), which should help put content providers at ease. The downside of Apple’s push to use DisplayPort: It’s still very early in this standard’s adoption cycle, and there’s no guarantee that DisplayPort will be used as pervasively as DVI is right now. Even if it is, it’s going to be an uphill climb for consumers, at least until more display vendors have more products on the market that use DisplayPort. Unless you’re content with the infinitesimal selection of displays that work with DisplayPort right now, you’ll have to buy more gadgets to get your new Mac to work with a DVI or VGA display. You’re going to pay $29 for the privilege of getting such an adapter through the Apple Store. Unless you need a Dual-Link DVI adapter to hook up a Cinema HD Display or another 30-inch LCD panel, that is—that’ll set you back a full c-note, and you’ll be waiting four to five weeks for it, according to the online Apple Store. What’s more, regardless of whether you buy Apple’s DisplayPort adapter or a third party’s (if you’re lucky enough to find one, that is), you’re going to mess up your desk with more boxes and wires getting that DVI or VGA display to work. For what it’s worth, Apple is one of the first major computer makers to actually release a system with DisplayPort on it, but it’s not the first company out of the gate with a product equipped with a DisplayPort connector. Dell released displays earlier this year with DisplayPort built in, and HP has since followed suit. PC users can also buy Windows-compatible graphics cards (from vendors that use both Nvidia and ATI chipsets) that have DisplayPort adapters built in. 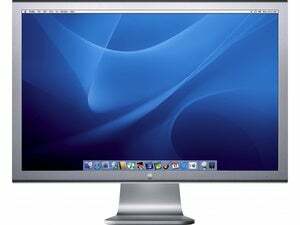 However, unlike HP and Dell with their displays, Apple is going out on a limb with its new 24-inch LED Cinema Display. That new monitor requires a DisplayPort connector, so for now, it’s only compatible with the new Apple laptops—at least until Apple upgrades the rest of its product line with DisplayPort connectors.